Anderson, Ind. 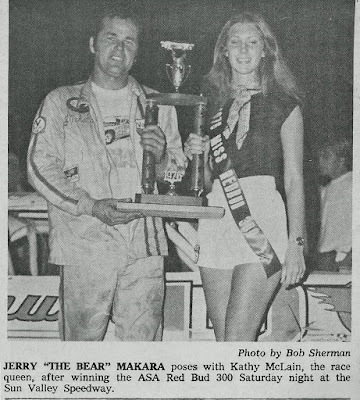 (August 21, 1976) – Jerry Makara of Westland, Mich., with two firsts and a second in the three 100-lap legs, captured the overall championship of the American Speed Associations’ Monza-style Red Bud 300 late model classic before 5,000 fans at Sun Valley Speedway here Saturday night. 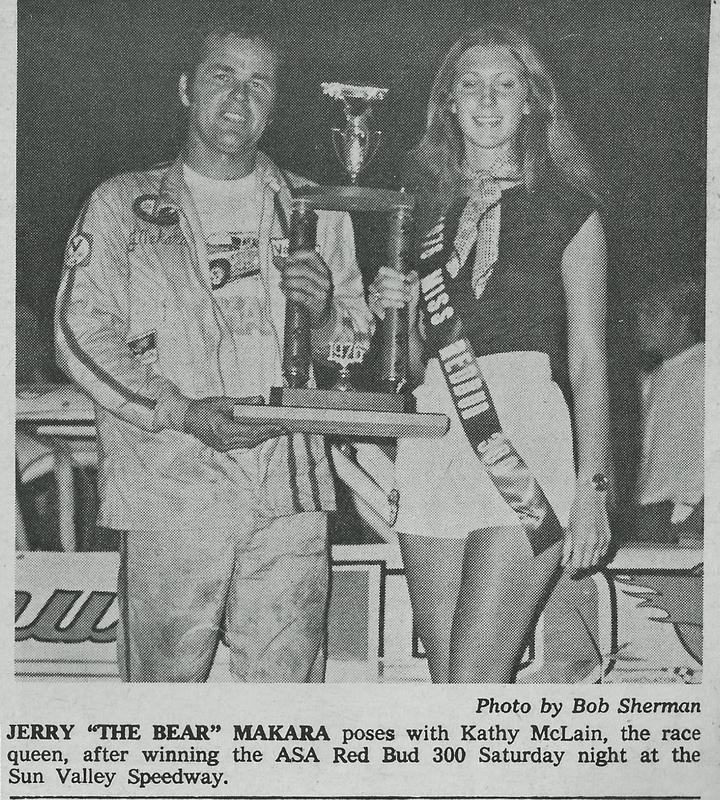 Makara’s three finishes in his 1976 Camaro gave him a five-point edge over Mike Eddy of Kawkawlin, Mich., who finished runner-up to “The Bear” for the second time this season in this type of feature racing. 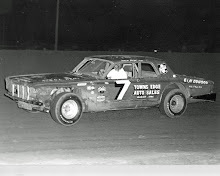 Dave Roahring of Bourbon, Ind., became the first driver ever to crack the 13-second barrier for one lap around the high-banked quarter-mile asphalt oval in a stock car when he was clocked in 12.973 seconds in qualifications in his Camaro. He wound up third, one point behind Eddy, in the final standings. 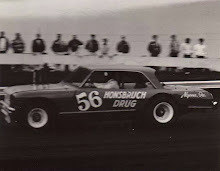 Frank Demske of South Bend, Ind., piloted his 1976 Camaro to aa fourth-place overall finish. John Anderson of Warren, Mich., who came back after having car trouble in the first leg to capture the second 100-lap run ahead of Makara, took fifth in the final rundown. 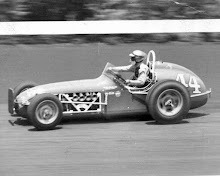 Don Gregory of Columbus, Ohio, led the first 100-lap leg for 82 laps before a battery cable shorted out, sending him to the pits. Makara, who started fourth and moved to third on lap 41 went into second on lap 74 and took over the top spot when Gregory left the race. L.J. Lines of Greensboro, Ind., starting outside on the first row, jumped Anderson on the start of the second 25-mile leg, and led for eight laps. Gregory, from hi fourth starting spot, moved into first on lap 9, and led three times before Andersson forged in front. Makara, from his 22nd starting slot, worked his way through traffic and finally made his hard charge pay off by passing Roahring on lap 54 to take over second. 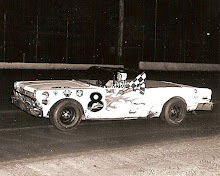 He couldn’t get around Anderson, however, and had to settle for runner-up money with Roahring finishing third. Then, starting on the pole. Makara led green-checkered to take the final 100-lap leg with Anderson chasing him the whole way but falling short by a car-length at the finish. 1. Jerry Makara, Westland, Mich.
2. Mike Eddy, Kawkawlin, Mich.
3. Dave Roahring, Bourbon, Ind. 4. Frank Demske, South Bend, Ind. 5. John Anderson, Warren, Mich.
6. Dennis Miles, Muncie, Ind. 8. 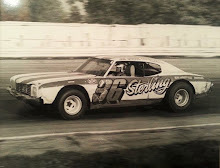 Larry Clemons, New Albany, Ind. 9. Bob Fields, Willow Branch, Ind. 10. Billy Howell, Louisville, Ky.